V2292. 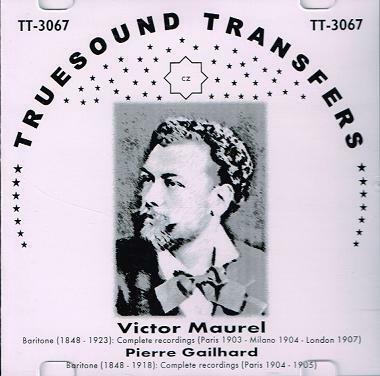 VICTOR MAUREL: Complete Recordings: 1903, Paris; 1904, Milano; 1907, London, incl. Songs by Gounod, de Lara, Massenet, d’Erlanger, Paladilhe, d’Hardelot, Hahn & Tosti; Arias from Don Giovanni, Iphigénie en Tauride, Falstaff & Otello (the latter two Creator Recordings); PIERRE GAILHARD: Complete Recordings: 1904-05, Paris , incl. ‘La Paloma’ (Yradier) (two versions); Arias from L’Africaine & Faust. (Germany) Truesound Transfers 3067. Transfers by Christian Zwarg.